Sometimes I eat something that isn't a veggie burger, but it's so good that I want to share it with the world anyway... Don't worry, this blog will always be about veggie burgers first and foremost! That is never going to change (there are still so many out there waiting for me to try them...!) But I've been tempted to start sharing one favorite non-veggie-burger vegetarian or vegan food item each month. How does that sound to you? Yes, that's a VEGAN "doughnut-croissant hybrid". 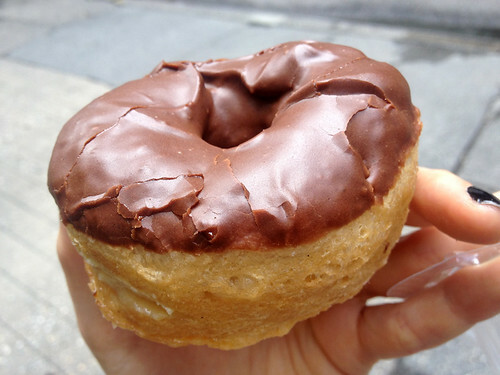 And a chocolate-frosted, cream-filled one at that. And yes, as this helpful little display sign at Peacefood explained... due to the cronut controversy, this is not a cronut, *wink*. 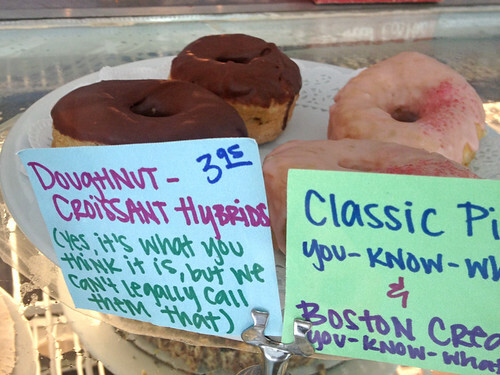 It's merely a "croissant-donut hybrid". I haven't tried a real cronut, so I can't say how it compares, but this was delicious enough for me! I don't know how often Peacefood has these available, or how quickly they sell out - I picked this one up before noon on a weekday, but I stopped in another day later this month and there were none in the display case. But if you see one, definitely give it a try! I've been hearing great things about these, um, dossants from Peacefood. Those signs are hilarious!